So I was walking around the garden centre earlier today, looking for something colourful to make the garden a more pleasant place to be as summer winds down, when I came across this stuff! My first reaction was, "Oh, that's really colourful! I didn't know heather came in so many different colours!" After being mesmerised by the vibrancy, and the undoubtedly striking colours, I took a look at the label, to find out more information. 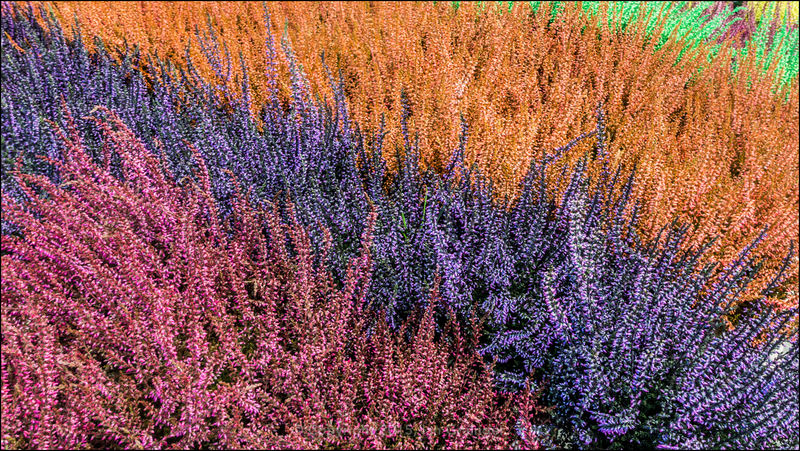 I was horrified to learn that... "This heather has been dyed using food colouring." I mean, what is wrong with people? Isn't nature astounding enough? Don't flowers come in a wide enough variety of colours without having to artificially enhance them using food colouring? However, for the sake of photography, I couldn't resist taking a snap of the madness, and have to admit it makes a pretty nice abstract, if not exactly as nature intended.